Today marks the 28th anniversary of the sinking of the Peruvian Navy submarine Pacocha which was lost off the Peruvian port of Callao near Lima. Running on the surface on the night of August 26th, 1988, the Pacocha was accidentally rammed by a Japanese fishing trawler. Mistaking the conning tower of the sub for a small craft and thinking the two craft would pass one another harmlessly, the trawler’s crew did not take evasive action and the trawler struck the sub’s hull. The Pacocha‘s captain, Captain Daniel Nieva and six crew members were killed immediately while twenty-two sailors were able to successfully abandon ship. The United States immediately dispatched an underwater rescue team, however, the Peruvians quickly deployed a diving bell and, within 24 hours, gained access to the sub’s trapped crew through one of the Pacocha‘s hatches. The remaining twenty-three crew were safely brought to the surface, escaping an excruciating death of painful asphyxiation from chloride gas or drowning as the sub’s remaining compartments slowly filled with water. Ironically, prior to its service in the Peruvian Navy, the Pachoca had been the USS Atule, a Balao/Guppy class diesel submarine whose sole kill during World War II was a Japanese merchant vessel, the Asama Maru. Later, the sub torpedoed and sank the former Kriegsmarine U-boat U-977 during naval exercises in 1946. After thirty years of service in the US Navy, the sub was sold to Peru where she was named after a 19th century Peruvian naval battle. Following the rescue of her crew, the sub was later salvaged and scrapped. 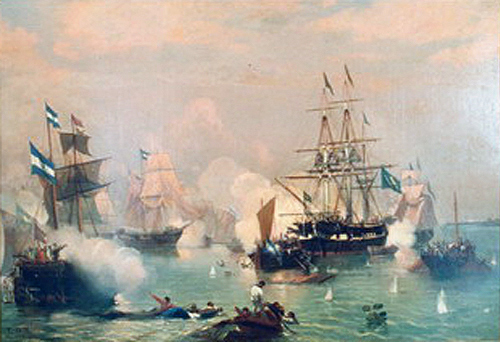 In the midst of the 1864-1870 Paraguayan War, the Paraguayan Navy launched a bold assault on the larger Brazilian Navy while it lay at anchor on the Riachuelo River. On the morning of June 11, 1865 a Paraguayan force of nine ships and seven armed barges approached the slumbering Brazilian fleet. The original plan was to board the Brazilian vessels while their crews were still ashore asleep, however, at the last minute the Paraguayan commander deviated from the plan and opened fire on the Brazilian ships from a distance. This proved to be a devastating mistake as the Brazilians were able to quickly rally, board their vessels and bring their superior firepower to bear on the smaller Paraguayan force. The Paraguayan fleet positioned itself so as to trap the Brazilian fleet in the river. The move proved pointless, though, as the superior Brazilian fleet audaciously steamed at the Paraguayans and rammed and sank several of the Paraguay vessels. By the time the smoke cleared, the Brazilians had lost only a single vessel while sinking four of the nine Paraguayan ships and all seven of their armed barges. The victory helped the Brazilians and their allies turn the tide of the war as Paraguay had enjoyed multiple victories early in the war. In all, nearly 1,000 souls perished in the early morning battle. The Telegraph is reporting that a combined British and Dutch group of explorers are mobilizing for an expedition to South America to locate the wreck of the Dutch slave ship Leusden. Widely believed to be the deadliest disaster to befall a slave ship, the Leusden ran aground on January 1, 1738 with a “cargo” of nearly 700 African captives. Prior to the early 19th century crusade of William Wilberforce and his fellow abolitionists to outlaw the slave trade, slave ships regularly plied the waters between Africa and the New World exchanging human cargos for sugarcane, molasses, silver, gold and other valuables. Although the trade was outlawed in 1807, it was only the iron fist of Royal Navy enforcement that prevented the horrific trade from continuing to occur. The Leusden, a Dutch West Indiaman, departed Ghana on November 19, 1737 after having waited six months to collect a full cargo. The ship had an uneventful passage until she was dragged ashore by a strong tidal current. Tragically, while the ship was aground, the rudder broke off and water flooded into the crowded confines of the hold. Abandoning ship, the crew left the 664 Africans trapped below-deck where they all perished as the sea clawed the Leusden and her 664 souls into her dark depths. In less than two months, the British and Dutch team hope to return to the site of the sinking off the coast of Suriname and conduct an in-depth survey of the wreck. The team has narrowed their search area and intend to use side-scan sonar to locate and survey the wreck. Not only would the discovery be archaeologically important, but it would also serve to highlight the heroism of men like William Wilberforce, Lord Grenville and Foreign Secretary Charles James Fox who passionately fought to end the disgusting and repugnant trade in human flesh. While today the US Navy’s Sea, Air and Land (SEAL) units have become household names for taking down Osama Bin Laden and Somali pirates, there was a time when their exploits were much more in keeping with their reputation as Silent Professionals. In 1989, during the invasion of Panama (Operation Just Cause), a team of SEALs played a quiet, but integral role to the success of the invasion. Although Panamanian dictator Manuel Noriega had been a US ally in the early 1980s, his relations with the US took a chilly turn in the late 1980s. Fueled by disputes over the Panama Canal Zone and the War on Drugs, tensions escalated between the US and Panama until December 20, 1989 when President George H.W. Bush ordered that Operation Just Cause be set into motion. One of the primary objectives of the invasion was to secure Manuel Noriega and bring him back to the United States to stand trial. The SEALs were tasked with preventing Noriega’s escape by capturing, disabling or destroying his private jet and gunboat. A team of four SEALs used a combat rubber raiding craft (CRRC) to approach within swimming range of the gunboat. The team then silently approached the gunboat, but were detected and attacked with grenades. Despite this minor setback, the SEALs successfully planted their explosives and exfiltrated out of the area. The gunboat was destroyed and, even though the plan had originally been to merely sever the propellers with explosives, in the aftermath of the attack one of the gunboat’s engines couldn’t even be located because so much explosives had been used. Meanwhile a team of three SEAL platoons moved on Noriega’s private, but unfortunately took 12 casualties including 4 KIA in a firefight surrounding the hangar. The jet was destroyed with rocket fire and the SEALs’ objective of sealing off Noriega’s escape routes was accomplished. Operation Just Cause concluded less than 2 weeks later when Noriega, who had holed up in the Vatican Embassy, surrendered to US forces. Only two days after the Nazi invasion of Poland on September 1, Great Britain declared war on Germany and dispatched the Royal Navy to clear the seas of Germany’s merchant fleet and warships. Within hours of the commencement of hostilities, the light cruiser HMS Ajax encountered the German merchantman Olinda off the coast of Uruguay and promptly destroyed the ship with gunfire. Shortly thereafter, Ajax found and sank another Nazi freighter, the Carl Fritzen. Ajax continued to serve on the South American Station until February 1940 when it returned to the UK for a refit. While on station, Ajax along with HMS Exeter and HMS Achilles accounted for the destruction of several more German merchant ships. Additionally, Ajax, Exeter and Achilles engaged the German pocket battleship Graf Spee which was scuttled by her crew after the Battle of the River Plate. Thus began a nearly six year struggle between the Royal Navy and the Kriegsmarine, Regia Marina, the Imperial Japanese Navy and even the Vichy French Navy.